​UMass Dining has accepted the EPA’s Food Recovery Challenge, pledging to improve our sustainable food management practices by preventing and diverting waste. We choose to follow the Food Recovery Hierarchy, which first prioritizes source reduction, followed by food donation, and composting methods. We believe that food waste should never end up in landfills. 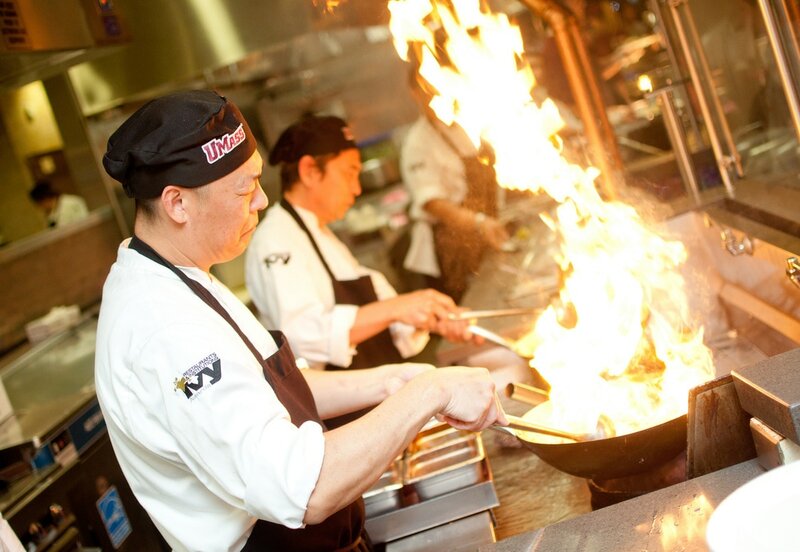 Customized meals include noodle bowls, stir fry, pasta pronto, sushi, and sandwiches. UMass Dining made-to-order stir fry station. UMass Dining works with the UMass Food Recovery Network, a volunteer-based student-run organization on campus, to donate leftover food from our dining commons to food insecure folks in the Pioneer Valley. Currently, the UMass Food Recovery Network donates to Craig's Doors, a local homeless shelter in Amherst. Students recover food from Worcester Dining Commons five days a week to deliver to Craig’s Doors. The Food Recovery Network is a national organization committed to reducing food waste and fighting hunger. Freed from liability, Universities can lean on the Food Recovery Network to provide meals for local homeless shelters. 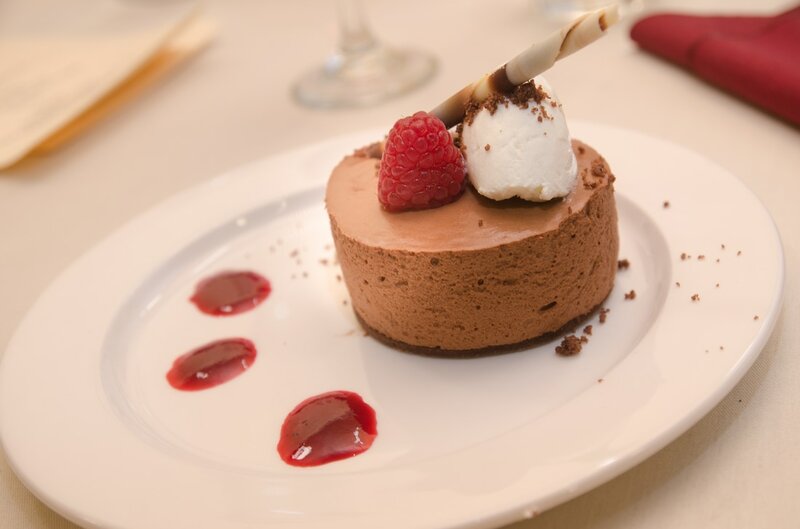 The UMass chapter of the Food Recovery Network diverts 100-200 lbs. of food from our waste stream every week. 100% of UMass’ compost is sent just 30 minutes from campus to Martin’s Farm, a local, family-owned commercial composting facility in Greenfield, MA. Martin’s Farm turns UMass’ waste into rich, dark, organic compost to be used by farmers and gardeners throughout the Valley. All food containers served on campus are compostable, as are our napkins, which are bleach-free and made from 100% recycled fiber. To educate students about what can be composted at our retail dining locations, we have installed easy-to-read signage at our composting stations. Composting is now our largest waste stream on campus. Every year we divert nearly 1,500 tons of organic matter from landfills, which is enough waste to fill 25 city buses. However, only 1% of the energy that is used to grow, process, transport, and prepare food is recovered by composting it. To meet our sustainability goals, we must think beyond composting for more innovative ways to reduce and reuse. Our composting program is made possible through our partnership with the UMass Office of Waste Management and the New England Small Farmers' Institute (NESFI). The face of the life-sized trash monster built by students in Blue Wall for the "Don't Feed the Trash Monster" campaign. 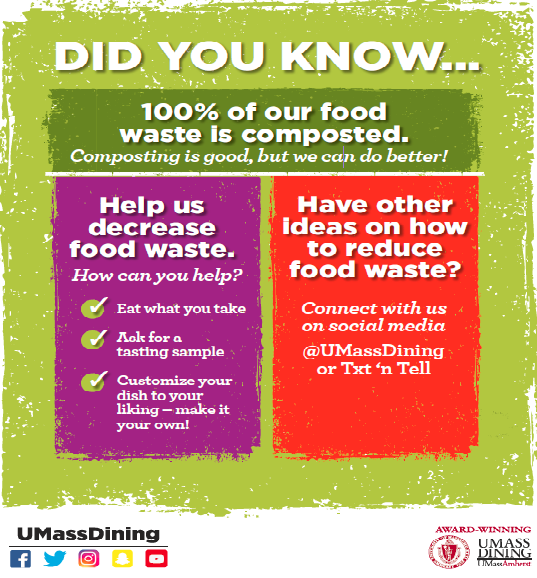 If you have an idea for how UMass Dining can further reduce our waste, please email your proposal to our sustainability staff here!